Eliezer Berkovits (1908–1992), a Jewish philosopher and theologian, is known for his philosophy of Judaism that focuses on man’s role in history, and his view that the task of Jewish philosophy is to “make Judaism a significant philosophy of life in the intellectual climate of our age … [and] equip it with the truth of God in relationship to the vital issues of present-day human existence.” A prolific writer who published nineteen books and hundreds of articles, Berkovits’s Faith After the Holocaust (1973) takes on the problem of evil in the wake of the Holocaust. Targum Shlishi recently supported the translation of Faith After the Holocaust into Serbo-Croatian so that the Jewish community there, under the guidance of Belgrade’s dynamic theologian, Rabbi Isak Asiel, could gain familiarity with Berkovits’s defense of the covenant. 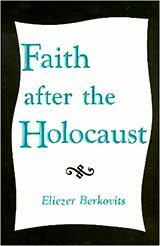 Among Berkovits’s arguments in Faith After the Holocaust is the consideration of human responsibility when considering the Holocaust and the role that Christianity played in promoting anti-Semitism in Europe. The newly formed FIU Holocaust Studies Initiative is university-community partnership dedicated to expanding FIU’s educational offerings related to the study of the Shoah in order to benefit not only FIU students but also the broader community. Targum Shlishi’s grant is helping to support the Initiative as a whole. In addition to courses, the Initiative organizes a host of related educational programs, such as lectures, museum exhibitions, films, continuing education opportunities, scholars-in-residence, and more. The Holocaust Studies Initiative is one of several Jewish Studies Initiatives offered at FIU. Targum Shlishi helped support image research and acquisition for Holocaust Icons: Symbolizing the Shoah in History and Memory by Oren Baruch Stier, a professor of religious studies at Florida International University. In this compelling study, forthcoming from Rutgers University Press, Stier traces the history and memory of four key symbolic remnants left in the Holocaust’s wake—what he calls Holocaust icons: World War II-era railway boxcars, the “Arbeit macht frei” slogan and gateway, the persona of Anne Frank, and the number “six million.” Like religious icons, these relics embody the past in the present and provide points of access to the horrifying realities to which they refer. Stier shows how and why these icons—an object, a phrase, a person, and a number—have come to stand in for the Holocaust. He discusses where they came from and how they have been used and reproduced; how they are presently at risk from the threats of relativization, commodification, and universalization; and what the future holds for the memory of the Shoah. Stier’s previous books include Committed to Memory: Cultural Mediations of the Holocaust (University of Massachusetts Press, 2003). David S. Wyman Institute for Holocaust Studies, General Support, Washington, D.C. The David S. Wyman Institute for Holocaust Studies teaches the history and lessons of America’s response to the Holocaust through scholarly research, public events, publications, and educational programs. Based on the research of Professor David S. Wyman concerning America’s response to Nazism and the Holocaust, the Wyman Institute focuses on the abandonment of Europe’s Jews during the Nazi era, the efforts to promote rescue, and the moral and historical lessons of those experiences. The Wyman Institute strives to bridge the gap between the scholarly community and the general public by making the historical record accessible to a broader audience through exhibits, speakers, educational curricula, and other forms of media. Targum Shlishi has supported multiple initiatives of the Wyman Institute, including books, conferences, and more. Targum Shlishi is supporting the development of a multi-day educational seminar in Germany whose objective is to teach students about democratic values and raise their awareness of misinformation and the prevalence of anti-Semitism and anti-Israel propaganda to which they are exposed. “In German media and especially in German school textbooks there is an astounding misrepresentation of the State of Israel,” explains Michael Spaney, executive director of MFFB. The MFFB is a German political consulting organization that, among other things, seeks to combat anti-Semitism, hostility toward Israel, and right-wing extremism in Germany and elsewhere. The curriculum that MFFB is developing will counter these biases not only for students but also for teachers. “We are taking into account the fact that most teachers have prejudices towards Israel—our goal is to educate teachers as well as students,” says Spaney. In the past, MFFB organized the Stop the Bomb campaign in Germany, focused on preventing a nuclear armed Iran. Targum Shlishi helped support the video documentation of interviews with the children of Holocaust survivors in Rhodes, Greece. The initiative was organized by the University of Hartford’s Maurice Greenberg Center for Judaic Studies and took place during July 2014 on the occasion of a conference held in conjunction with the seventieth anniversary of the round-up of the Jews of Rhodes. Most of the individuals interviewed were descendants of the approximately fifty Jews on Rhodes who were Turkish or had Turkish connections and were saved from deportation in 1944 by the Turkish consul-general in Rhodes, Selahattin Ulkumen, who was later honored as a Righteous Among the Nations by Yad Vashem. The interviews were connected with an archaeological research project on the three synagogues in Rhodes. This video documentation work is part of a larger project called In Our Words, an initiative to interview and archive testimonies of second- and third-generation descendants of survivors by the University of Hartford’s Maurice Greenberg Center for Judaic Studies in order to document and research the lasting effects of the Holocaust in twenty-first century Jewish society. To view some of the interviews, visit the Greenberg Center’s YouTube channel. Award-winning filmmaker Elkan Spiller finished work on L’Chaim! in early 2014 and began applying to film festivals, seeking distribution, and fundraising for this next stage. L’Chaim! is a feature documentary about the relationship between a Holocaust survivor and her adult son, who after years of world travel and various successful (if eccentric) business ventures, devotes his life to caring for her. The film is both a particular story about altruistic love and deep humanity and a larger commentary on ways in which the trauma of the Holocaust affects the next generation, the children of survivors. Spiller spent years shooting the footage for the documentary, much at his own expense. A short film drawn from this material, Mama L’Chaim, won several awards internationally, including first prize from the Los Angeles Museum of the Holocaust short film festival. Targum Shlishi has supported this project at various stages of its development. Anna Olswanger’s children’s novel Greenhorn, based on the true story of an eleven-year-old Holocaust survivor in a Brooklyn yeshiva in 1946, was adapted into a short indie film; Targum Shlishi helped support the filmmaking process. 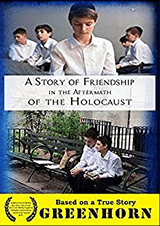 Olswanger, who co-produced the film with Tom Whitus, notes that soon even the youngest survivors of the Holocaust will be gone, and children will not have a direct connection to the Holocaust: “Greenhorn, along with other Holocaust films and books, could be their only connection. We intend Greenhorn to be a film for the next generation,” she says. The film was primarily shot at The Actors’ Temple in Manhattan. It was completed in fall 2014 and premiere screenings took place at the Landmark NuArt Theatre in Los Angeles and The Museum of Tolerance in New York.